Watch the golfers tee off from the extended lanai or just enjoy the relaxing view of the water and the great outdoors. 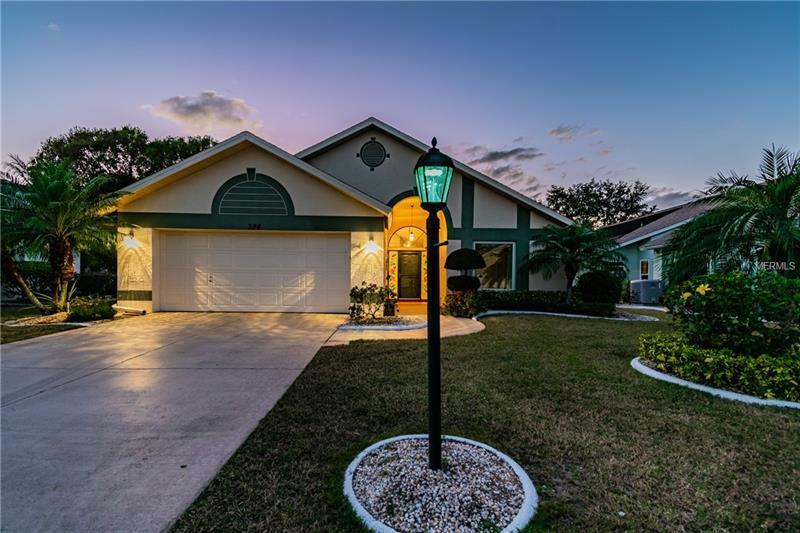 This lovely CALOOSA GOLF COURSE home has two bedrooms and a den which could be used as a third bedroom or office. Enter through the majestic stained glass entry way into the large living room and see beyond to the greenery. New hurricane impact windows upgraded eat-in kitchen with genie sliding drawers and the formal dining room will impress you. This split plan offers the master suite with walk-in closets and a guest bedroom with a large shower instead of the usual tub/shower combo. The Carrier HVAC is 2 years old. The electrical and plumbing have also been upgraded. Home also has a water softener. Sellers will provide a wind mitigation upon request as well as $2000 toward new flooring in the living room. The 2-car garage has a pull-down ladder for attic storage and a key pad garage door opener. Enjoy Sun City at its best with fantastic amenities activities and a variety of clubs. Join in the fun in this 55+ community. You will love it here!